There's something almost bittersweet with the release of each new Discworld novel from the incomparable Terry Pratchett. Since the publication of THE COLOUR OF MAGIC in 1983, Pratchett has been making readers laugh through a vast comedic cavalcade of yarns peopled by a patchwork of wonderful and amusing characters. But since his diagnosis of a rare and early form of Alzheimer's in 2007, the delight in each new book has been coupled with an underlying gloom as faithful readers wonder if it will be his last. Nonetheless, his books are still a joy to read, and his latest work, UNSEEN ACADEMICALS, is just as uproarious and fun as any other. This time around, the peculiar denizens of Ankh-Morpork must pull on the uniform of athletics. Lord Ventinari, the kind and benevolent tyrannical ruler of the city, has decided that the powerful and wise wizards of Unseen University need to bring an old tradition back from the dusty pages of history: the faculty, students and staff are to field a football team. Of course, one of the main drawbacks to this decision is that none of the wizards actually know how to play the game. But most shocking is that not only are they commanded to win a match, they must do so without the use of magic. As if the argumentative, magic-prohibited wizards trying to learn the rough-and-tumble game of football weren’t enough, we are also drawn into the story of Mr. Nutt. An over-educated goblin with a past shrouded in mystery, Mr. Nutt doesn't know anything about himself, and his journey of self-discovery is the heart of UNSEEN ACADEMICALS. Throw in a fashion model, a tin-can-kicking street punk, and a wicked good pie maker, and you have the standard fare for tackling the sport of football in Discworld. Although the book is a fun time, Pratchett doesn't really seek to break the mold as it were. His readers keep returning because he gives them exactly what they want, and he gives it to them perfectly. It's a beautiful symbiotic relationship each feeding off the other. Fans will be pleased to know that there's so much to like and find hidden in the jokes laden throughout the novel, jokes that Pratchett has mastered over the years. 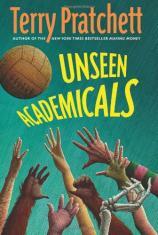 UNSEEN ACADEMICALS is not just a moderately successful installment; it edges slightly above that, though it does fall below some of his more magical endeavors. But the beauty of Discworld is that it is a home away from home. It is a medieval adventure realm and a treasure trove of old friends who pop in and out to remind you just how much you enjoy opening the cover of every new Pratchett book and, with a knowing smile, escaping into a world of absurdity.